August 28th marked one month since our family moved to New York. It was also the day that Hurricane Irene hit Long Island. 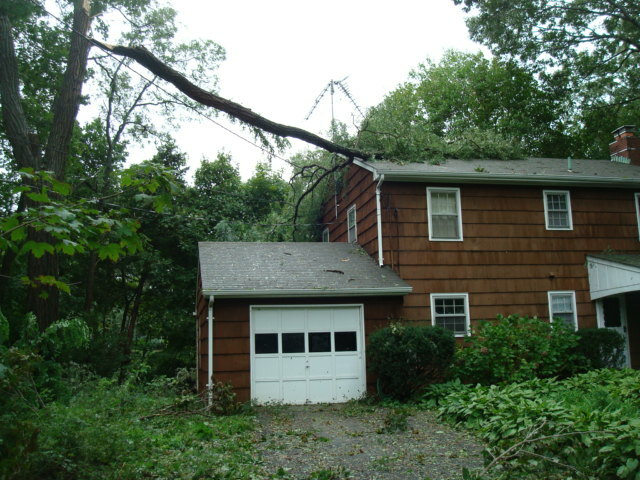 Specifically, Irene hit our house by knocking a large tree limb onto our roof and pushing a piece of the limb into our attic. A couple of hours later, we watched as electrical lines snapped and caught fire at the end of our driveway causing a contained fire to burn for almost forty-five minutes. Needless to say, the early hours of Sunday were not spent sleeping! The best way for me to describe the events of the past week and a half is go back to before Irene was even an issue. Earlier in the week (pre-Irene), New York experienced a mild earthquake. As my fellow co-workers started coming out of their offices wondering if anyone else felt the shaking, I heard myself exclaiming, “Does New York get earthquakes?” By Thursday of that same week, the weather forecasts for theLong Island area did not look good. Irene was indeed headed our way. Again, I found myself asking others, “Does New York get hurricanes?” The last hurricane in this area was in 1985 and she was called Gloria. She left extensive damage too. Thursday evening found Brad and me out filling our car with gas, and stocking up on batteries and water. Many other Long Islanders were doing the same thing, and already many stores were sold out of these supplies. Also during this time, Stony Brook was preparing to register new students and to begin classes on Monday. On Friday afternoon, the Headmaster called together the faculty and spouses to tell them how the school was going to prepare for the hurricane. Again the feeling of, “is this really happening?” washed over me. School would be delayed until September 1, and we were given a list of how to best prepare for the hurricane. Saturday found me preparing our basement for the possibility of flooding and making it ready to hang out in, if need be. Here’s the thing about moving: you unpack as best you can on the main floors where you live each day, and everything you else you don’t need or don’t know what to do with, you throw down in the basement. Guess how our basement looked? It was a long day. Around 3:30 am Brad and I woke up to hear the thud of the tree limb crash onto our roof. Since the hurricane wasn’t supposed to be at her worst until later on Sunday, we had decided to sleep in our beds and to try and get as good a night’s rest as possible. At first we thought it was the TV antenna that had fallen onto the roof. Looking out of our windows, we couldn’t see anything. The loud thud prompted us to move downstairs, and to try and finish the night sleeping on the living room floor. Of course, the sleeping part didn’t happen because then we had the excitement of the electrical fire. Our power finally went out for good around 5:30 am. We wouldn’t have our power back until Wed. evening. The school wouldn’t have full power in all its buildings until Friday. I really missed not having gas since this meant more cold showers. Earlier in the month, our oil tank needed to be filled and afterwards the line taking the oil to the boiler became clogged. We experienced several days of no hot water during that time (thank God it was summer! ), and now once again we were back to cold showers. The next several days we found ourselves living according to the sun. In certain ways, it was idyllic. When the sun was up, we were up. When the sun went down, we went to bed. I felt like I was living a scene straight out of The Little House on the Prairie. But it wasn’t all sentimental moments of a by-gone era—food was spoiling, work was delayed, and the cold shower routine with no power to blow dry my hair was getting old fast! I had to remind myself that many others were off much worse than we were. On Wednesday evening as I returned from a friend’s house, I noticed lights in the distance. Imagine my shout for joy as I ran up the little hill to our house and saw the lights were back on. I made good use of our electricity that night running the washing machine, the dishwasher, and enjoying the sensation of just flipping a switch and having light. Thursday marked the first day of school for Brad, Jacob, and Anna. I was relishing the fact that I had one more day before I returned to work. I couldn’t believe the role reversal I was experiencing in that moment. After five years of being the one to head off to teach, I was the one staying home, while the rest of the family left. I wasn’t sad for too long, though, as my to-do list was quite long for the day! That afternoon as I was pulling out of the driveway to go grocery shopping, I received a frantic phone call from Anna telling me she was sick. This was her first day of 7th grade. I rushed over to the building she was in only to find her really sick—food poisoning kind of sick. Fortunately, another teacher heard her in the bathroom and was with her until I got there, and was a big help in other ways too. As we slowly walked home that afternoon, I couldn’t help but feel like enough was enough. I found myself telling God that I thought I had learned enough lessons in patience and perseverance in the last several days. It was time for a break. It’s funny how I felt the need to inform God of my circumstances—as if he didn’t already know. Yet, that’s exactly what I was doing. I know that my circumstances of the past week and a half were mild compared to many around the world. I don’t know what it means to really suffer. I was merely inconvenienced. I hope I can remember that the next time another hurricane comes my way. As the Chinese curse goes “may you live in interesting times”. Glad everyone is safe and that a hole in the roof was the major damage. Seems manageable, as you and Brad demonstrated. Bummer about Anna — been there, done that, its massively miserable. Glad your family is safe. Thanks for writing this Alicia. Quite the welcome you’ve received. Looking forward to reading more. I am so glad that you have some time now to settle you all in. We know it won’t be long before you’re talents will be put to good use in many ways. I hope you can rest a bit first. As you know, I LOVE your writing! This one had me in laughs and in tears. Sorry for the laughs, as I’m sure none of you found this to be funny, but Brad . . . a pad of paper? So Brad, I love it.